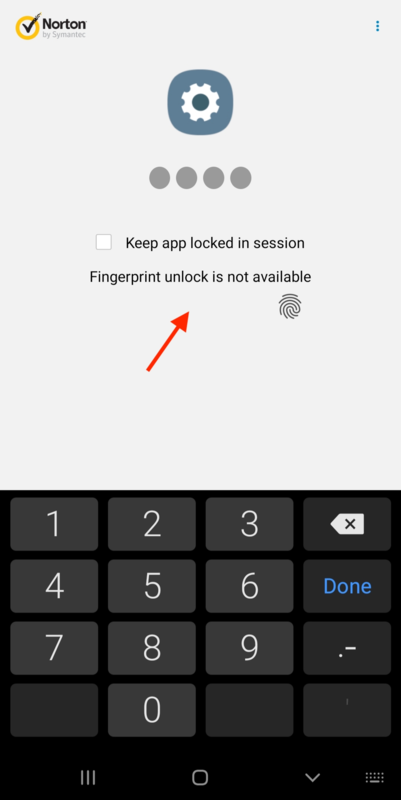 The Norton App Lock v1.4.0.449 started showing the "Fingerprint unlock is not available" message each time, meaning a manual pin is required each time. Any plans to fix this soon with a new app update ? I take it you had the fingerprint unlock working before the OS update? If so, does it still work for any other apps or functions on the device. Maybe the OS update reset the fingerprint data on the device. Try re registering your fingerprint. First try restarting the device again after the Android 9 update. If that does not help, try changing your PIN for App Lock and see if the fingerprint option is available again. And if that does not help. Just like OS upgrades on PC's can fry some software installations, the same can happen on mobile devices. Try uninstalling App Lock, restart your device, then reinstall and set up a PIN again. Then test for the fingerprint function. The only app it does work for is the norton app lock it self (the "Fingerprint unlock is not available" note is not shown when accessing the norton app lock and it is able to read the fingerprint). It doesn't work on any other app. One question about the reinstall. Did you clear cache and data before the uninstall, and then restart the device before reinstalling? One thing that has caused issues with some apps is the Battery Optimization settings in Android. Try looking for the Battery Optimization in Android Settings, then turn off optimization for Norton App Lock. Then test. P.S. also my note from earlier saying: "...worked only until the phone was restarted..." could've been a mistake, perhaps I was looking the lock app it self where it works continuously in all scenarios. When you turned the fingerprint setting back on, did you have to re register your fingerprint? If not, try re registering your fingerprint and restart the device then test App Lock. I have a Samsung Tab A but no fingerprint reader and only on Android 8. I have an update on this issue from my Norton contacts. we are aware of the issue and it only seems to occur on Samsung devices on Android 9.0. We can't quite do a thorough investigation since this OS is not available globally yet. Norton has not seen this issue with other devices on Android 9. As it is device specific, it is always possible that the device manufacturer would have to develop an update to fix the issue. I'll let you know if I hear anything more on this. @peterweb Tnx for the feedback.